Crop circles have been associated with aliens for years. Many people believe there is no explanation of why, and some have gone as far to say that they are symbols marking where to "attack" or that aliens are trying to communicate with us through something that are similar to hieroglyphics. They appear often on television shows about aliens, and are mocked in Scary Movie 3. A medium is someone who can communicate with ghosts or spirits. These individuals often use their "powers" to help others communicate with their deceased loved ones to create closure between them or set peace. There are even shows and movies based on this. One show was called The Ghost Whisperer, which ran for several seasons. Although the scenarios in the show were not real, the concept was very real. The main character would be contacted by ghosts and she would have to seek out the person they are trying to contact, to create closure, and they would go to "the light," or "heaven." Another show, which is allegedly real, would be The Long Island Medium. Her name is Theresa Caputo, and she is seeked by the living in hopes to contact their loved ones who have passed away.
. this is the long island medium. Carl Sagan prefaces this book by crediting his parents for teaching him the true essence of science. He recollects that not one of his highly intelligent school teachers were able to teach him then most important aspect of science, it is a mindset to use as a tool throughout life. When he was a child his parents brought him to the 1939, “World’s Fair”, and introduced him simultaneously, to a world of wonder, and skepticism, which launched him into a lifelong journey in search of discovery and truth. Throughout this book, he explains how the scientific method, empowers us as individuals and as a society. He states, “it is far better to grasp the Universe as it really is than to persist in delusion, however satisfying and reassuring.” Pseudoscience, is reassuring when we don’t have all the answers, it fills in the gaps of knowledge, with ignorance. I found Chapter 4, Aliens, to be quite entertaining. In it, Sagan lays out an interesting scenario of how a lucid dream can turn into an alien abduction, he discusses the probability of UFO’s landing on earth an abducting thousands of people who claim to have been abducted, without any, concrete evidence. In great detail, he explains how our minds can play tricks on us, and how we fill in the unknown, with what makes sense at the time, based on things we've seen or read that is stored in our subconscious . For instance, many years ago a movie depicting aliens, as little grey beings with huge dark eyes was released, and shortly after, people reported seeing little gray aliens, with big eyes. This book, in keeping with this class, has been an eye opening, and educational experience. I have discovered how ridiculously gullible I have been about a wide range of subject matter. This class has taught me to be skeptical, because if you choose to believe everything you hear without question, you will condemn yourself to a life of ineptitude. In this time of political debate, and world turmoil, it is important that we sharpen our skeptical senses, to question the status quo and discover the truth. Why people believe in weird things is a book by the author Michael Shermer, and rather just analyze conspiracy theories, Shermer instead looks at how average people can wind up with bizarre beliefs. The author even does his own research, often by personally interviewing believers or taking classes that claim to alter one’s state of mind. He entertains their ideas, then looks at the possible psychological reasoning behind the beliefs. Covering a wide variety of topics such as holocaust denial, out of body experiences, and alien abductions. One of the best sections for me personally, was when Shermer discussed his experience with alien abduction. The book makes it abundantly clear that the author has no belief in the paranormal, so the idea that he “saw aliens” really came out of left field. But then Shermer explains the circumstances behind his abduction. As it turns out, he was really into long distance biking which meant getting minimal hours of sleep for days at a time. He was exhausted when he saw some sort of disk come down from the sky and aliens brought him inside the craft. When he awoke, it turns out 90 minutes had passed and he had no memory of what went on inside the spacecraft. This experience shook up the sleep-deprived Shermer, where he even believed his entire bicycle crew was replaced by aliens. An otherwise intelligent man was quizzing his friends to see if they were real, even asking if they glued together his things with spaghetti sauce. I find it pretty remarkable that Shemer was able to look at such a personal experience and concluded that it was actually a result of his sleep deprived hallucinations. Shermer recognizes that even if aliens did exist, they likely wouldn’t have abducted him or looked like little grey men. One subject Shermer spent a lot of time investigating was the concept of ESP. Our lectures often discussed how these psychics rely on vague language, and Shermer has personally met with a proclaimed psychic named Van Praagh who did just this. This psychic who actually appeared on Oprah would spit ideas, like “I’m seeing water. Did someone’s loved one die in the ocean?” to a large crowd. In a room full of adults, it’s likely to have people who have lost loved ones in a variety of ways. It’s a technique called cold reading, basically casting a wide net by asking basic questions, while hoping the audience will ignore any wrong predictions. People would rather have faith in a psychic, rather than question their actual accuracy. While it’s impossible to completely separate a human from illogical emotions, a book like this really helps the reader acknowledge their own faults. It’s common for money grabbing or ignorant fads to gain traction on social media, and mindlessly get passed along by people who simply assume the information to be true. Teaching people to be more critical of the information they consume can possibly mean these “viral” trends gain less traction, helping prevent an exponential spread of incorrect information. Overall, the book is really worth the read if you want to teach yourself to critique your own ideas, to better your own understanding of human psychology, or even expand your argumentative skills. 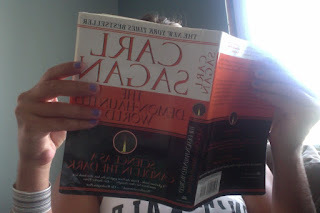 I read Carl Sagan’s The Demon-Haunted World: Science as a Candle in the Dark. I chose to read this book because of the vast amount of topics discussed by the author. He discusses topics such as witches, UFOs, religion, demons and many more. Sagan does a great job of showing the different views people have and explaining both sides of the story. He makes a great effort to show the difference between proven scientific phenomena and the pseudoscience that plagues the field. He presents a logical argument and scientific reasoning to debunk common myths found throughout science. 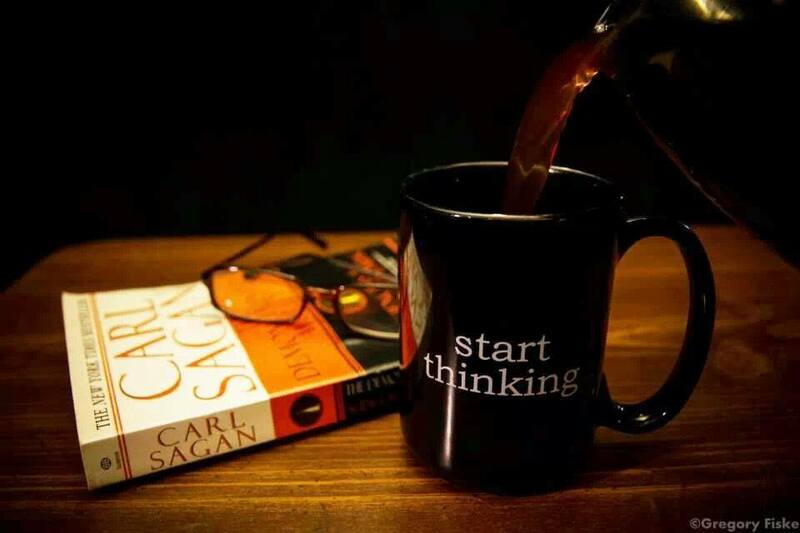 In doing so, Sagan encourages you to think rationally and to not fall victim to mass hysteria or believing everything you see and read. My favorite part of the book is the chapter called The Dragon in My Garage. In this chapter he tells someone he has a dragon in his garage. He takes them to see it but you can’t, he says it is because it is invisible. The person says to put powder on the ground to see the footsteps, but Sagan’s says you cannot do that either because the dragon floats. They tell him to use infrared goggles but Sagan tells them that won’t work because the fire breathing dragon it heatless. He does this just to counter every possible physical test of the dragon’s existence. The point of the chapter is that just because you cannot prove that the dragon doesn’t exist does not mean the dragon is real. This is the same as with other myths in the world. The inability to prove something a myth does not make it a reality. I chose to read The Demon-Haunted World: Science as a Candle in the Dark by Carl Sagan. This book discusses twenty five different pseudoscience topics, such as aliens, witch craft, demons, and explains how they are not scientifically proven or accurate. He discusses these topics in a way to show the difference between science and pseudoscience. He does not just go into scientific facts about each topic, he makes the reader feel as though he is speaking to them, and even jokes around. He discusses skepticism in a way that is easy to comprehend. This book shows how the universe should be understood, not perceived. Here is a nice little picture of me reading this interesting book. My favorite topic in the book was UFO's and extraterrestrials. I wrote my first blog post on crop circles, and have continued to research them since reading this book. I have always had a weird interest in extraterrestrials, but I feel like a lot of people do. I would take out books on UFO's from the library in elementary school, and continued to do research in high school. Sagan's information on extraterestrials was very accurate and related to other books I have read on the topic. I had never read anything on the crop circle phenomenon though, so I really found an interest in that. It blows my mind that even after people confessed to creating the crop circles themselves, they still believed that UFO space ships were landing in crop fields. It really shows that people will believe anything interesting, and the media really does not portray the truth most of the time. This book is related to class because this class is all about pseudoscience, and so is this book! Both the class lectures and Sagan's book discuss many of the same topics. Two topics that stood out to me were UFO abduction and falsely recalling information. Both the lectures and Sagan discussed that people can believe they were abducted by aliens through suggestive interviews and therapy. Many people who talked about being abducted by aliens used information that was closely related to TV shows and movies about aliens. Sagan discusses that many people who describe how aliens looked were related to TV shows playing at the time. Our class lecture talks about the same type of thing, and says that people began saying they were abducted by aliens around the same time that documentary style movies and TV shows came out. This book is very much related to the topics discussed in this class. This book does not only relate to this class, but also can relate to the real world. I feel like everyone should read this book, or even just some of the chapters that interest them, so they can realize the difference between science and pseudoscience. Many people are very easily tricked, and should really learn what is true and what is not. One real world problem that this book can assist on is helping people understand scams. I definitely learned so much from this book about what is real, and I hope other people can do the same. A few weeks back a resident at a nursing community passed away. He was sort of a grumpy man but a nice gentlemen none the less. A few nights after his passing a nurse reported something strange. The call lights in the main foyer indicating a resident needing help was lighting up. Upon further investigation it was found that none of the residents had turned on their call light. The nurses returned to work but only a few minutes later the same thing happened. They went to down the hall and reset every light only to find that they could not fix the problem. They went into the only unoccupied room in the hall, the same room the gentleman had passed away in only a few days before. As soon as they entered they had an eerie feeling, it was cold and creepy in the room. They reset the call light and made a joke about how it could not have been that room because the resident was no longer there and ghosts are not real. As they left the room and walked back to the nurses station they noticed something odd in the dining room. They entered the dining room to see streaks in the shape of a hand print going down the glass window on the door heading outside. 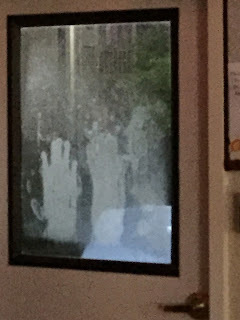 They went outside and wiped the prints and left the dining room. Upon returning to the dining room only minutes later they found the same marking on the door. The picture they took is attached below. While there are probably many ways to explain what they saw, no one can deny that this is one creepy tale. Clinton Road is an old road in West Milford. In the early 1900s there was a castle on the land out this way. In 1917 when the owner died the land and house was sold to the City of Newark. After some time a fire destroyed what was left of the property and now Clinton Road is known as one of the more eerie and unsettling places in NJ. There are many stories surrounding Clinton Road. One of the more popular tales is that of a ghost boy summoned by throwing coins into the water. The story goes that if you throw coins into the water under the bridge by dead man's curve, you will awaken the ghost boy and he will throw them back at you. There are other legends as well and they can be found in the attached link below. 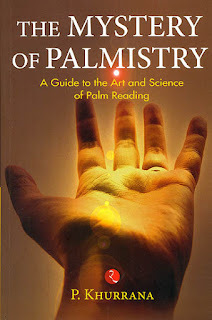 It is very well known that palm reading is very generalized, and basically a scam. Yet millions of people are getting their palms read every single day, and there are many different places to get your palm read in every area. Why do people still continue to go along with this scam? Because everyone wants to know what their future holds. There is no way to find out what will happen in a persons future, but if someone tells you that they can read your palm and tell you your future, it is pretty tempting. Palm reading is not a very cheap service either. One palm reader, Sarah Larson, calls herself Dr. Larson, and sells palm reading programs for around three thousand dollars. Many people are tricked into paying for this because she calls herself a Doctor, so she must be able to be trusted. Many palm readers also refer to palm reading as a science, but there is no scientific evidence that palm reading is accurate. I have had to palm read twice. My first experience was a total scam. I went with my grandma, who was dying of cancer, and some how my grandma relayed that information to the palm reader and she took full advantage of my grandma. She convinced my grandma that she needed to pay to buy a special rock and carry that rock around for a week, and then bring the rock back and pay her to read the rock with her energy on it. My grandma was literally dying and had hope for everything, and this women completely took advantage of her. The things the palm reader was saying to me were so off. She would ask me a question and ask if I could relate to something, which I could not, and then she would get frustrated when she couldn't catch me on something. My second experience was even worse, probably because it was a palm reader on the Wildwood boardwalk. I won't even go into talking about that one. From research and my personal experiences with palm readers, I believe that they truly are a scam and people should not be spending thousands or dollars, or even $15 on them. One night, about two years ago, my friends and I decided to go to Pleasant Mills Church. We heard rumors that there was a haunted bridge behind the church, as well as a haunted cemetery attached to it. We arrived at Pleasant Mills around midnight, and immediately, the place felt eery. We walked around to the back of the church, where the bridge was located. It was a pretty calm night, without any wind, so you couldn't hear the water moving in the stream. We were told that we should stand on top of the bridge, and yell for “Emily.” So we did. As each of us called her name, the water under the bridge became more and more rapid. The water became so rough, it was crashing on the bridge we were standing on. As we realized what was happening, our hearts were racing and we ran away from the bridge, back into the parking lot, in front of the church. Next to the church, there was one street light that kept the area well-lit. As we stood there under the light, laughing nervously at what just happened, a shadow flashed in front of the light. At first, I felt like my mind was playing games with me, but as we all stared at the light, we saw a shadow figure lingering in the light. We ran back to my friend’s truck and jumped inside, locking the doors. We sat in the truck for about 15 minutes before deciding that we were going to try to walk through the cemetery, two by two, as we heard you should. As we walked through the cemetery, the air began getting thicker and I found it harder to breathe. We walked about halfway through the cemetery before realizing it was best to turn around to go back to car and leave. We left, and I have not been back since. As much of a skeptic as I am when it come to these things, it was truly strange to just be walking through a cemetery and out of nowhere I was struggling to breathe. This book was written by Carl Sagan who is a professor of Astronomy and Space Sciences and the Director of the Laboratory for Planetary Studies at Cornell University as well as co-founder and President of the Planetary Society – which is the largest space-interest group in the world. In the book, he emphasizes how people who believe suspicious things like UFO’s, ghosts, demons, etc. allow themselves to be conned into believing it and he uses logical reasoning to invalidate numerous claims of pseudoscience by adopting and using tools such as rationality and critical thinking. For example, things like the face of the Virgin Mary on a tortilla or an eggplant that closely resembles Richard M. Nixon lead people to believe that it’s a divine extraterrestrial intervention, but it’s not. It’s just that there are so many eggplants that one is eventually going to resemble a face, even one in particular (Sagan, p. 47). The book also talks about how American’s believe that aliens come and visit earth pretty frequently and that approximately more than three million American’s believe they have been abducted by said aliens. The problem with this is that the pollsters never asked anyone if they were actually abducted thus the conclusion that millions of Americans were abducted is based on careless experimental design (Sagan, p. 64). Sagan also writes about UFO gullibility and the weather balloons deployed by the Air Force in the 1940s through the 1950s that were used to spy on the Soviets and the balloon that crashed near Roswell. Most of the evidence regarding the crash points to the high-altitude classified balloons but the press released that it was a spaceship from another planet (Sagan, p. 81, 82). Sagan also discusses hallucinations, gullibility, and paranoia. He uses bizarre ads placed in UFO magazines as an example of audience gullibility and continues to disprove other topics and emphasizes that people should become less gullible and more skeptical (Sagan, p. 94). When it comes to my favorite chapter, I was torn between “The Demon-Haunted World”, where Sagan write about demons such as the incubi and the succubi (Sagan, p. 111) and “No Such Thing as a Dumb Question”, where Sagan talks about how ignorance feeds on ignorance and that our species needs and deserves a citizenry with minds wide awake and a basic understanding of how the world works. Ultimately, I’ll have to go with the latter because This really impressed me when I read it. I can’t help but agree with him. He concludes the chapter by explaining just how important science is to society and how it is an essential tool for any society with a hope of surviving well into the next century (Sagan, p. 308, 316, 317). In regards to relatability, the text can be related to the slides on UFO abduction that stated that those that believe typically have the other esoteric beliefs, report having the experiences during sleep or sleep deprivation, have higher rating of fantasy proneness, and more instances of sleep paralysis. Overall, if you like science, I think you’ll love this book. Personally, I think the book can help people become less susceptible to believing hearsay beliefs within pseudoscience and adopt critical thinking as a tool during times of uncertainty. The abduction of Travis Walton became the most popular of all abduction stories; both a movie and a book were written about it entitled, “Fire in the Sky.” Travis’s story is that he and his fellow loggers were driving home after work when they all saw some type of unexplained light on the horizon. Intrigued, the men drove towards the light and discovered some type of disc-like object that resembled a diamond emitting a beam of light down to the ground. Travis decided to get out of the vehicle and examine it more closely by stepping inside the shaft of light, peering upwards towards the object. The light beam shocked him, picked him up and threw him to the ground. Travis was knocked unconscious as his friends retreated in the vehicle, afraid of the unexplained object. About a quarter mile down the road, they decided to turn around and go back for Travis. Upon their return, there was no trace of Travis or the object they saw so they went to a shopping mall and contacted the sheriff’s office. The police, suspicious of the story searched the area for Travis but were unable to find him so they went to Travis’ mother’s house and explained to her what happened. His mother didn’t show any emotion to the breaking news which led police to think that they orchestrated a fake disappearance. Over the course of the next few days, search parties were dispatched in hopes of finding Travis, but were unable to locate him. Travis eventually contacted his brother on the phone and explained that he was at a gas station some odd 30 miles away. When his brother picked up him, he appeared very weak, hardly able to stand on his own feet. Travis told his brother about his abduction and wanted to see a doctor immediately. 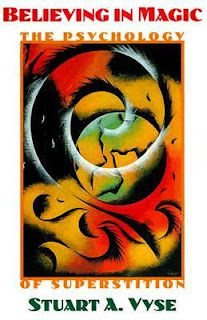 The doctor noted that he had a red mark on the inside of his elbow, which may have been reminiscent of a hallucinogen he may have injected which may be how he came up with his abduction story. He claimed to have woken up in a room with 3 alien being standing by him. He described the beings as weak, fragile beings with hairless bodies and large eyes with slits for mouths. He grabbed a pole and advanced towards them, forcing them to retreat into the hall. Travis followed and discovered a room with what appeared to be a captain’s chair, illuminated by numerous buttons and switches. The room dissolved into a planetarium when he stepped into it, but reverted back when he stepped out of it. He was then confronted by another alien being, a bit more muscular than the other and wearing protective equipment. This being escorted Travis out by the arm through different rooms until he was placed on a table and fitted with what appeared to be an oxygen mask, forcing him to lose consciousness. When Travis awoke, he found himself near the gas station where he contacted his brother and saw the alien craft ascend into space. The story has been critiqued by skeptics ever since the story became public due to having suspicious variables in the story. Personally, I think he’s lying but a lot of people believe this story is true. Ed and Lorraine Warren are celebrity’s in the paranormal community. They’ve been solely responsible for the development of Hollywood titles, such as “The Conjuring” which was based on a true story and “Annabelle,” the movie's prequel. Annabelle was one of many Raggedy Ann dolls that was purchased for a daughter named Donna for her 28th birthday in the 1970s. According to Donna, her roommate witnessed the doll move on its own and became fearful of its presence. They each discovered the doll in different rooms from where it was previously left. They’ve even discovered the doll standing and leaning against a chair. It was also said that the doll would write things down in child-like handwriting with messages that said things like “Help Us” on pieces of parchment Donna didn’t own and had no clue as to where it came from. When Donna discovered blood on the doll, she decided to speak to an expert. A medium conducted a séance with the doll and discovered the spirit of a 7-year-old girl child possessing the doll. According to Ed Warren, God doesn’t allow the spirits of children to go into a doll so that it must have been a demon impersonating this 7-year-old. After the doll caused Lou - Donna’s roommate’s fiancé – physical pain, the Warren’s were contacted and took possession of the doll. Ed Warren claimed the Annabelle doll was responsible for the death of a young man who challenged the doll to do its worst, and it did. He died in a motorcycle accident upon leaving the museum. I wanted to make a post about the tunnels known as the Gates of Hell, located in Clifton, NJ. The tunnels are formally known as the Weasel Brook underground, which were constructed to collect water during rainstorms. Rumor has it that these tunnels lead to a portal to hell. The tunnels themselves are a site of satanic happenings, missing persons and animal sacrifices. Since I was in high school, I’ve heard stories of this place by multiple people who have ran out of the tunnels because of immense fear. Inside the tunnels, rooms with animal carcasses, candles, satanic and other obscene graffiti as well as other unnerving things can be found. I’ve always wanted to visit these tunnels, but I haven’t due to the possibility of being arrested for trespassing. Inside the tunnel is insane, there’s ladders, different corridors, and walls you have to walk on to get to different locations while trying to balance your weight. The deeper you go, the darker it becomes. Some people are unable to get too far because of how dangerous it is and not having the proper equipment necessary to navigate the tunnels. Do these tunnels actually house a portal to the underworld? Not likely; however, they’re still spooky as ever. Carl Sagan's The Demon-Haunted World is a powerful novel written to encourage people to understand and accept science. It is a request to get the readers to use their minds and think for themselves, rather than just take what the media gives them with no questions asked. Sagan's expertise and impressive resume give him the credibility that allows this novel to be an educational, accurate depiction of the true meaning of science. The chapter that stood out to me the most was 'Aliens'. Growing up, I was always intrigued by the extraterrestrial life that potentially visited our planet from time to time. One of my favorite movies was Signs because I loved to freak myself out by imagining that aliens really tip toe around the corn fields at night, leaving us messages. It was really interesting to read about the crop circle hoax conducted by Doug Bower and Dave Chorley, fooling people for fifteen years. Although it was fake, people believed it. In fact, they believed more easily that the circles were a sign of extraterrestrial life than humans taking hours to meticulously create them. We can't be so naive as to think that aliens don't exist. Whether they have visited Earth or not, they're out there somewhere. This chapter ties into the alien abduction stories we have read about in our lectures. When aliens became more prominent in movies and documentaries, accounts of alien abduction sky rocketed. This is similar to in the book, when other people began to catch on and create crop circles, too. It strikes a sort of phenomenon amongst people who are looking for something seemingly impossible to believe in. While taking this course, I have began to look into things from a deeper perspective. The other night I sat on the beach and looked up at the sky for hours, pondering of all that takes place in the universe. Being able to see Saturn and Mars, I imagined creatures on those specks of light, looking back at me. After reading Stuart Vyse's book Believing in Magic over the past couple days I have concluded that I have a few superstitious beliefs. For example: When I do something like read a book or do homework I like to do it all at one time. Why do I do this? I'm not completely sure. Maybe because I've formed a habit that makes me feel comfortable when doing something I don't really want to do. Stuart's book really helped me become aware of these small idiosyncrasies I have and to me that's exactly what the book wants to accomplish. Vyse really analyzes why people believe in the things they do even when rational thinking says to believe otherwise. He demonstrates how most people have a superstitious belief and then asks why? In the book he goes over everything such as: individual personality traits, cultural beliefs, mental illness, you name it. all to get to the bottom of why people hold the beliefs they do even when they defy logic. I think my favorite part of this book is Chapter 7: A Magical View of the World, because it answers the question of "okay now that I know that I'm superstitious what can I do about it?" He says a couple ways to stop superstitious thinking is to teach critical thinking or promote science education to young children. These small steps can help stop the development of a superstitious belief system and replace it with a logic based belief system. I'm actually extremely happy I chose to read this book with the course. I don't know if I would have liked the other books more, but I plan to read them just because of how much I enjoyed Vyse's book and this course. What I loved is that the book and course seemed to be designed to bring awareness to us psychologically. There were so many times I caught my self and analyzed the superstitious thought that passed through my head. Why was I having it? Where did it originate? Does it logically make sense? The course was almost like cognitive behavioral therapy for me haha. In conclusion, I found that a book and course like this should be read/taken by everyone at some point during their lives. I took a poll of 30 random people asking if they believed in magic or held any superstitious beliefs. Out of the 30 random people I asked all of them answered yes to the questions. I could only imagine this on a larger scale. This course, my little experiment, and the book show that most people hold superstitious beliefs and some are harmful to people. That's why I think people need to become self aware and disregard the harmful beliefs by reading a book like Vyse's. The Demon-Haunted World: Science as a Candle in the Dark is a 1995 book written by astrophysicist Carl Sagan. This book’s purpose is to inform and educate people on how to use science to think skeptically and critically, and why it is important to do so. Throughout the book, Sagan writes about topics such as pseudoscience, UFO’s, religion, ghosts, hallucinations, witches, and telepathy, as well as many others. He offers insightful invalidations of pseudoscience, and logical reasoning for claims that are made involving the supernatural. Without criticizing the opinions of others, he objectively sheds light on the lack of evidence of many common beliefs. In this book, Sagan teaches the reader how necessary it is that in order to truly understand the world for what it is, rather than how we would wish it to be, one must be able to differentiate between the myths of pseudoscience, and scientific truths. I actually enjoyed this entire book so much that it was hard to choose a favorite section or topic, but if I had to pick, I would go with the chapters “The Most Precious Thing,” and “Therapy.” The Most Precious Thing” is the first chapter and it is a necessary basis that one needs to understand in order to thoroughly comprehend the rest of the book. Sagan begins by relaying his conversation with a driver, who had a good amount of “questions about science”…he was wondering about extraterrestrials, sunken continents, etc. Sagan then states how those questions aren’t about science at all, and how upset the driver looked after he told him that there isn’t any evidence for those things. Then, he goes on to explain how even though those myths aren’t real, there is so much in real science that is actually more exciting and mysterious. It set the tone for the entire book, and enticed my curiosity to read further. Sagan writes about how science can help, where pseudoscience cannot, “We can pray over the cholera victim, or we can give her 500 milligrams of tetracycline every 12 hours.” (9.) He writes about the importance of science and how ignorance serves not one of us any purpose. Sagan claims that “pseudoscience is based on insufficient evidence [that] ignores clues that point the other way.” (13.) After reading this chapter, I was easily able to tie it in with concepts we have learned in class. Our lesson on “Ways of Thinking” is so closely related to this chapter; the difference between fast and slow thinking, and the elements of thought that are necessary in order to think critically are prevalent throughout the entire book, and are introduced in the first chapter. Sagan exemplified being a fair-minded thinker by showing empathy for other people’s points of view, but also showed intellectual integrity by explaining that facts are necessary in order to believe certain things. I found this interesting because it goes to show that the therapist’s beliefs of the patient’s past can either cause the patient to repress a memory further, or to recall a false memory. In class we learned about the results of the Florence False Interpretation Study, which showed that a therapist can make people believe they have had experiences they never had through dream analysis. The study also showed that clinicians can have a strong suggestive influence on their clients, and that an early hypothesis adopted by a therapist can be detrimental to the client.